Affordable urban living for millennial families with children has the potential to become one of the largest market demands in the near future. This article was originally published in two excerpts by Strong Towns, https://www.strongtowns.org. My interest in this issue came from my husband’s and my own struggle in dealing with it. Like many young adults of our millennial generation, my husband and I spent the decade after graduating college living and working in some of the major metropolitan cities in the US and abroad – cities like London, New York, and Washington, DC. As we entered our 30s and started thinking about having kids, we wanted to find a place to start our family that would allow us to maintain our urban lifestyle with our children, both for our sake and for theirs. However, as architects and urban designers on middle-class salaries, being able to do so affordably in these top-tier cities seemed impossible. What we desired was to live and work in a great urban neighborhood within these top-tier cities that was safe and inclusive of quality kid-friendly amenities, institutions, and infrastructure. 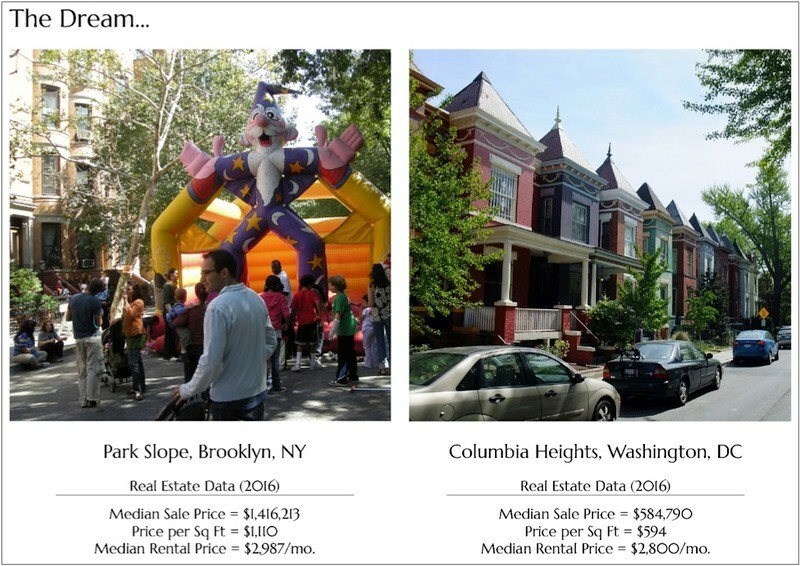 We longed to settle in places such as Park Slope, Brooklyn, or Columbia Heights, Washington, DC. Now, why use Tulsa? Tulsa – a highly conservative, slow-to-change, oil-and-gas-dominated city – is one of the most unlikely suspects to attract young, urban, well-educated, forward-thinking, entrepreneurial millennials. Yet, once we moved there, that’s exactly what we found. Before looking further at the solutions that Tulsa and other 2nd- and 3rd-cities offer millennials (especially those with kids), let’s pause for a moment to talk about the data and potential market trends to come. First, we all know that millennials now make up the largest portion of the population and that the majority of them – roughly 71% – want to live and work in walkable, mixed-use urban neighborhoods. Furthermore, though birth rates have decreased and, as of 2010, only 36% of millennial women have had children, studies have shown that another 47% of millennials still desire to have children eventually (Pew Research Center survey 2010/2011). They are simply waiting until later in life to do so. Financially, 62% of millennials have incurred student debt at an average of $27,000, and just under a third get help with expenses from relatives (ULI survey 2014). Let’s put this in perspective. A generation ago, when our parents were buying their first home with very little or no student debt, $27,000 was actually the median sale price of a new home in the US in 1972. In fact, even during the housing bubble of the late 1980s, the median sale price of a new home in 1989 was $120,000. At this price, $27,000 would easily cover a 20% down payment for a mortgage. Finally, given these financial constraints, what are the trends in living arrangements of millennials? According to a 2014 survey, 50% of millennials are renters (27% of whom live with roommates), 21% live at home with their parents, and 14% live in multi-generational households (ULI survey 2014). These numbers have increased over the last generation, thus showing a trend in shared living arrangements. In fact, as of 2014, 18% of all Americans (i.e. 57 million people) live in multi-generational family households, which is double the number of those who lived in such households in 1980 (Pew Report 2014). What all this means is that over the next decade or so, we are potentially looking at a baby boom creating a significant number of households with children that strongly desire to (continue to) live and work in walkable, mixed-use neighborhoods, and that are also open to creative living arrangements to make life affordable. 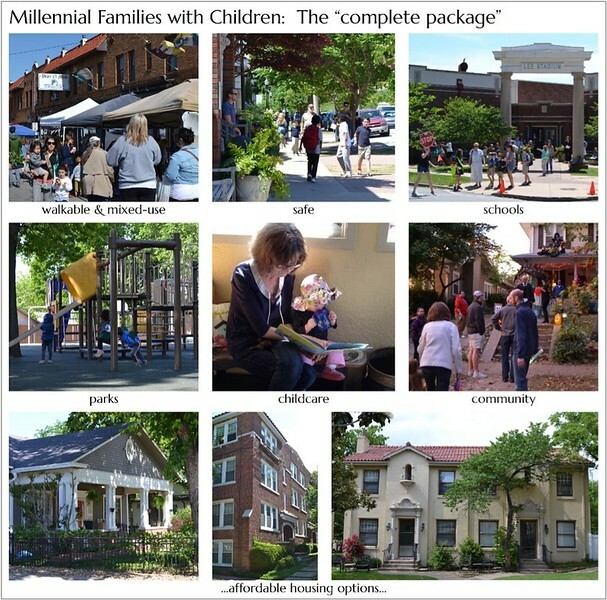 What these urban, child-bearing millennials want is the “complete package.” They want neighborhoods that are not only walkable and mixed-use, but are now also safe for kids with good schools, good parks, good childcare options, a good community, and…they want it all for a good price (i.e. they want housing options that they can afford). This is where Tulsa fits in. In fact, all the photos immediately above were taken in our walkable, mixed-use neighborhood in Tulsa. Ultimately, as millennials with children get priced out of the major metropolitan cities, they are now looking at 2nd- and 3rd-tier cities to provide them with what they want. What they are finding in these 2nd- and 3rd-tier cities is affordable housing in traditional pre-war neighborhoods on the immediate edges of downtown.